As a live attendee, you will take part in 4 compelling votes, giving you the ability to shape the direction of this expert discussion. 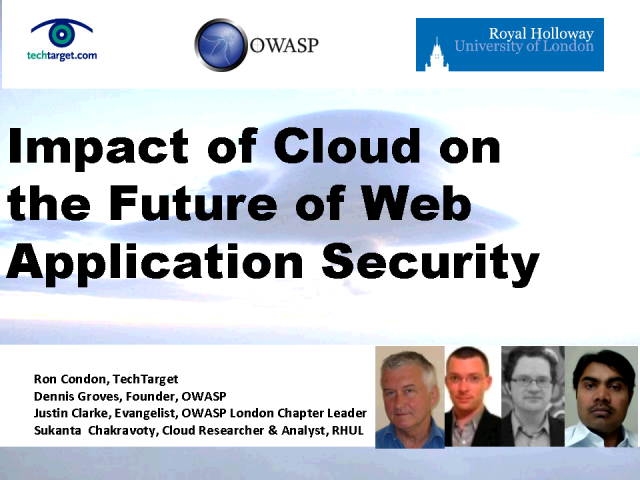 Does the cloud change web application security? Does the CSA, Jericho, ENISA provide sufficient guidelines? Does the cloud make compliance more difficult? View live to take part and hear the results of the audeince vote. Dennis Groves is the co-founder of OWASP and a member of WASC. His contributions to OWASP include the "OWASP Guide" downloaded over 2 million times; now a reference document in the PCI DSS standard, and the de-facto standard for securing web applications. Sukanta Chakravorty is currently a Cloud Researcher at ISG & RHUL and has previously held senior executive roles in Incident Response Management and IT at Wipro.